A midnight taxi to the US embassy; an emergency flight home; a new life in New York. An ex-Muslim tells his story. Mahad Olad was in a Nairobi hotel room, looking at his mother. She was holding two articles from a student newspaper in New York. In the first article, Mahad, then 19, said he was atheist. In the second, he said he was gay. His mother - a Somali Muslim - could not tolerate it. She was sending him, she said, to a group of Sheikhs (tribal leaders). The Somali Sheikhs would reform him. Return him to the community. Make him Muslim. Make him straight. Mahad had read about gay conversion in Africa - the long, religious lessons; the abuse - and wanted no part. He was happy being gay. He was happy being ex-Muslim. He nodded, smiled, and told his mother he would do as she said. Then, after she left the room, Mahad made a phone call. As one door closed, another one opened. Ex-Muslims of North America is a group for people who leave Islam. Their slogan is: "We envision a world where every person is free to follow their conscience." Many of their members - often the children of immigrants - are shunned by their family. Some receive death threats. Mahad needed their help. From the hotel room, he called an Ex-MNA member in Minneapolis, the American city where he grew up. The group contacted the US embassy in Nairobi. The Americans were happy to help - Mahad is a US citizen - but there was a problem. The embassy was on United Nations Avenue in Gigiri, a neighbourhood of big houses and blue pools. Mahad's hotel was 10 miles away in Eastleigh, a Somali enclave known as Little Mogadishu. Embassy staff don't travel there. Ex-MNA spoke to their Somali members, who spoke to contacts in Eastleigh. A late-night taxi was arranged. Now, Mahad had to slip away without being seen. Mahad was in Kenya with his mother, his older brother, an older sister, a younger sister, and two nephews. His passport was in his mother's room. He crept in, took it while she slept, and went downstairs. Mahad scanned the hotel for his older brother. He was still up and - if he found him - would try to stop him leaving. Nervously, Mahad went outside. He found the cab, got in, and headed across from Nairobi; leaving behind the only people he knew in the city. At the embassy, he showed his passport to the Kenyan guards, and went inside. A US counsel was waiting. He interviewed Mahad and let him stay at his house, in a gated compound. When they went outside, an armed guard came with them. Four days after reaching the embassy, Mahad left Kenya on a ticket paid for by Ex-MNA. After three flights, he arrived in Ithaca, New York, the city where he goes to college. It was 31 May 2017. He hasn't seen - or spoken to - his family since then. Mahad knows when he began leaving Islam. The explosion, and the screaming, and the terror, are hard to forget. He was born in Kenya in 1997, after his Somali parents fled the civil war. In 2001, the family moved to Minneapolis, Minnesota. When he was 13 or 14, they moved back to Kenya for around a year. Mahad enjoyed it. He went to a madrassa - an Islamic school - and didn't question his religion. And then, in September 2012, the grenade was thrown. "It happened just a few feet away from me," he says. "They attacked a church. I literally had to run for my life." Islamists threw an explosive into a Sunday school. One child was killed; three were seriously injured. That night, Mahad heard a Muslim cleric preaching from a pulpit. "He said the attack was justified," says Mahad. "He was basically a very Wahhabi - Salafi preacher [an ultra-conservative form of Islam]. It wasn't uncommon for him to say these things. "I was like, this is what my faith promotes. This is what Islam stands for. And if all these theories about Islam being inherently connected to violence are true, then I don't think I can consider myself a Muslim." When the family went back to Minnesota, Mahad read widely. He would go online or take out library books, hiding the covers from his family. "What solidified my disbelief was reading atheist literature, exposing myself to secularism," he says. "I would read Richard Dawkins, Christopher Hitchens, those kind of people. That's how I started gaining the vocabulary for what I was feeling." Discovering Ex-Muslims of North America - who, at the time, existed only on Reddit, an online forum - was also influential. "That's when I realised there was a community of people that are having these issues too, and they go by the name ex-Muslims," he says. "I didn't even think of that term. I didn't know it existed." Around the same time, Mahad realised he was gay. "I guess one of the reasons I started questioning religion was because I felt I couldn't reconcile the two," he says. "I did not believe there was a space for me, as a gay person, to be Muslim." Mahad's father was a religious teacher at a madrassa; his mum worked for a non-profit organisation. Mahad was a teenager torn between two cultures. "Being openly gay, openly atheist, is opposed to my culture and my religious background," he says. "It's not something my parents and family members would ever accept." Mahad is the second-youngest of seven siblings. He wasn't close to any of them. But he was open at school - "It was pretty accepting," he says - and, occasionally, his parents would confront him. "I would deny it," he says. In his spare time, Mahad was a student activist: American Civil Liberties Union; Planned Parenthood; Black Lives Matter. He wasn't unhappy, but he looked forward to leaving home. When he left high school, his mother wanted him to go to college nearby. Instead, he chose Ithaca College, 1,000 miles east in New York state. "They didn't try to stop me - they just didn't want me to leave," he says. "They said 'If you've got to go, you've got to go.' So I left." After his first year in Ithaca, his mother said she was visiting Kenya, and asked if he wanted to come. He would be back, she said, on 30 August. "I had nothing planned that summer - no internships, no jobs, nothing," he says. "I was like, you know, I might as well go back to Kenya. I was there when I was 13, I was really nostalgic. I was like, 'I want to visit this place again'." Mahad thought it was a holiday. He even had plans to tour East Africa - Uganda, Ethiopia, Djibouti, maybe Somalia. And then, the day after they landed, his mother came to his hotel room. She brought two articles from his student newspaper. Mahad's mother couldn't even read the articles: she doesn't speak English. Someone in Minnesota's tight-knit Somali community had shown them to her, and translated. 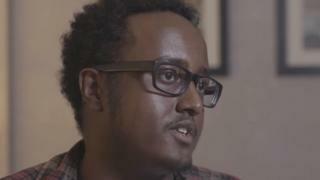 After fleeing his family in Nairobi, Mahad felt "emotionally devastated". "It was a pretty traumatic experience," he says. His American college, though, was a big help. They gave him financial support and somewhere to live, even during summer. He is also grateful to the US Embassy. Mahad is now in the second year of a political science and history degree. He hopes to work for a non-profit when he graduates; perhaps become a lawyer. But this isn't a happy ending. Not yet. "Even when I'm walking outside on campus, I don't feel physically safe," he says. "I feel someone will come and attack me." He has given pictures of family members to campus police. Why, then, has he chosen to speak out? "I'm hoping to start a dialogue," he says. "These things aren't exclusive to Somali people. It happens across various cultures - Muslim families who feel their children are exhibiting what they call deviant behaviour. "I want to give a voice to the voiceless. This stuff happens a lot - but people don't speak out." A US Department of State official said: "We are aware of US-Somali citizens, primarily young adults, who are enrolled in schools in Kenya and Somalia by their parents. "These students are often unaware when they are travelling overseas that they will be placed into these schools for an indeterminate amount of time. "Some of these schools routinely use corporal punishment and abuse. By most accounts, the parents are unaware of the abusive conditions of these schools. "As we learn more about these facilities, we will pursue outreach opportunities to young adults and parents in the US-Somali community to spread the word."